Since I bought the DSLR camera I dreamt about the total lunar eclipse observation. I wanted to repeat my observation scheme on a different, much better equipment. Recently I observed total lunar eclipse in 2015 with the compact camera only. 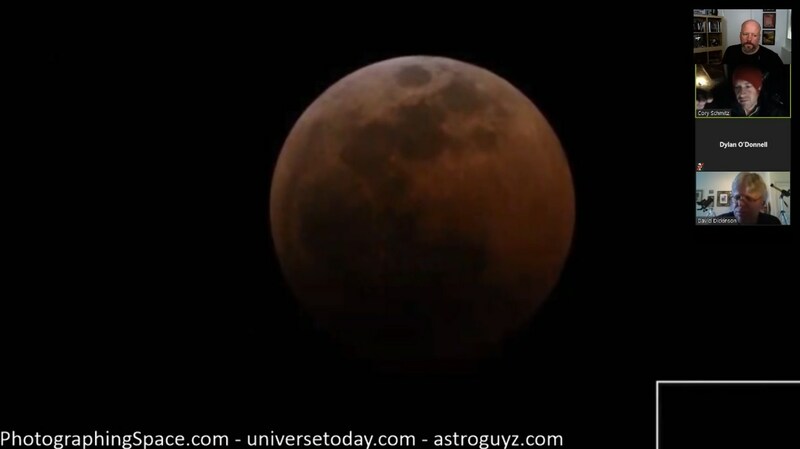 Therefore the total lunar eclipse occurring on Friday’s evening 27th of July 2018 was good ocassion to see and documentate this celestial event. Due to this I had a few observation goals like watching the totally eclipsed moonrise, light difference documentation from mid-eclipse onwards and observation of the Mars planet being in conjunction with Moon and approximately in opposition to Earth. 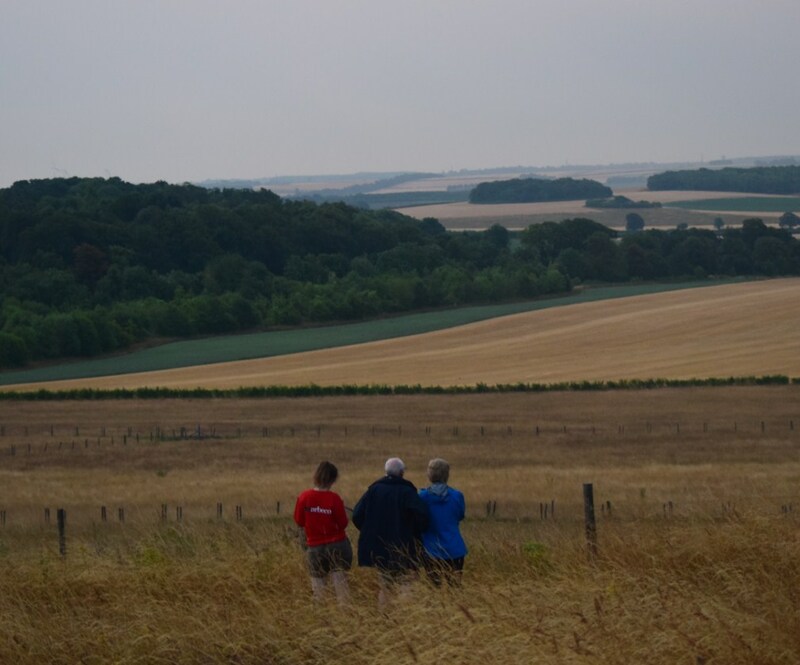 I was looking forward this perfect and warm Friday’s evening more because of extremely long dry spell in east England, which lasted from mid-June. Unfortunately the weather forecasts for Friday 27th were not favourable. The cold front was predicted, although according to some services rain was appear to occur around midnight. If so it could give me a perfect ocassion to see the eclipsed moonrise and assess the moment when the reddish Moon will become visible on the twilight sky. I was aware of change the visibility conditions, typical for the front-bearing weather, when sky become more hazy. In this event the red Moon could not be visible as same moment as normally. Anyway option to see a red moonrise from the British Isles was an unique ocassion, thereby the awaiting was really nervous. I was checking the numerical weather forecast since Wednesday, but they were getting worse as Friday approached. I was hoping that this weather prediction will be delayed and I will experience this unique event eventually. Pic. 1 Cloudiness above Europe at 22:00 UTC+2 on Friday 27th July 2018 , infrared image (sat24.com). Pic. 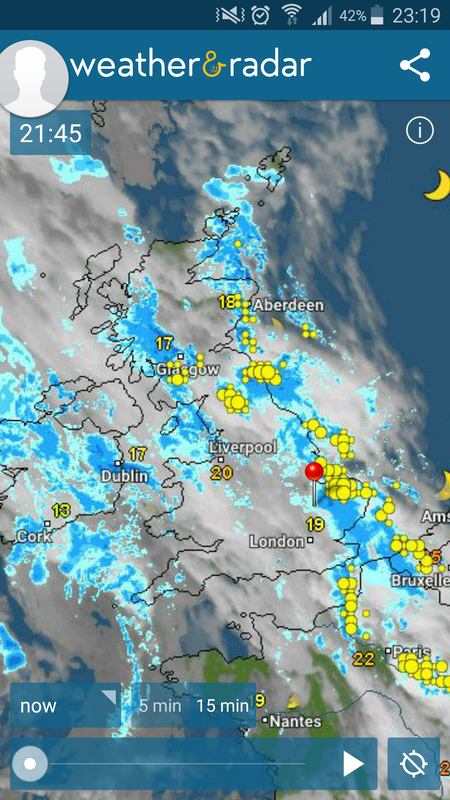 2 The weather situation above United Kingdom at 21:45 UTC+1 on Friday 27th July (Weather & Radar app). Unfortunately the worst option happened and on Friday 27th around 5pm started raining. 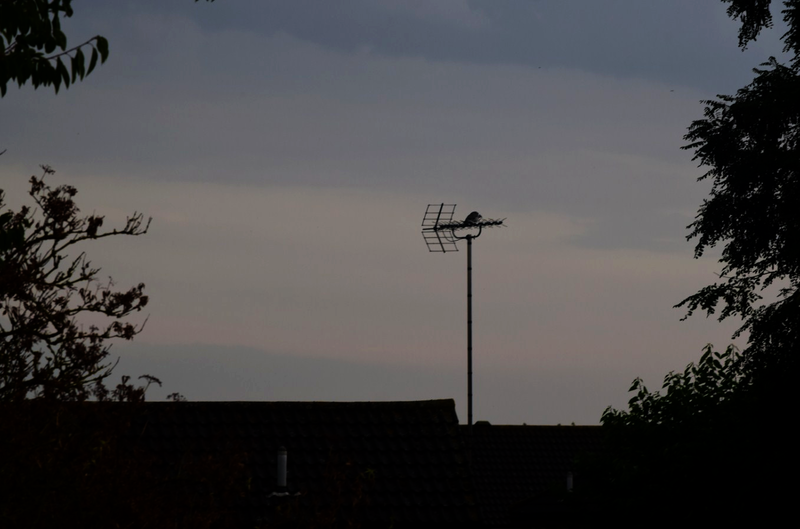 Between the thunderstorms passing above the Cambridgeshire area I still could see the clear section of eastern and south eastern sky, that kept me in hope seeing at least a bit of lunar eclipse. I even considerated to go to the Great Yarmouth coast to try to catch some clear sky. Moonrise there occurred 5min earlier than in Cambridge, according to forecast rain was about to come around midnight. Finally I rejected this idea. Pic. 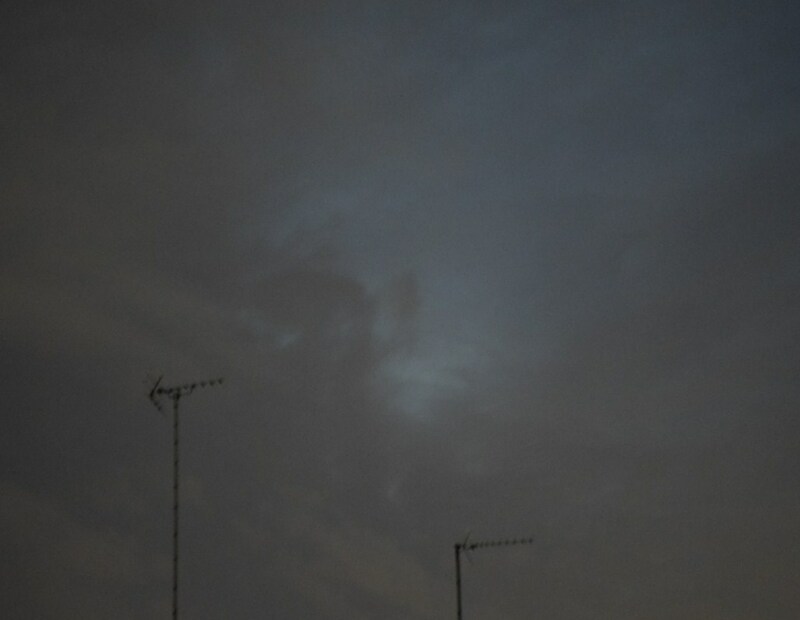 3 Elongated clear section of sky above eastern horizon, whereas Cambridge was facing series of thunderstorms since 5pm. 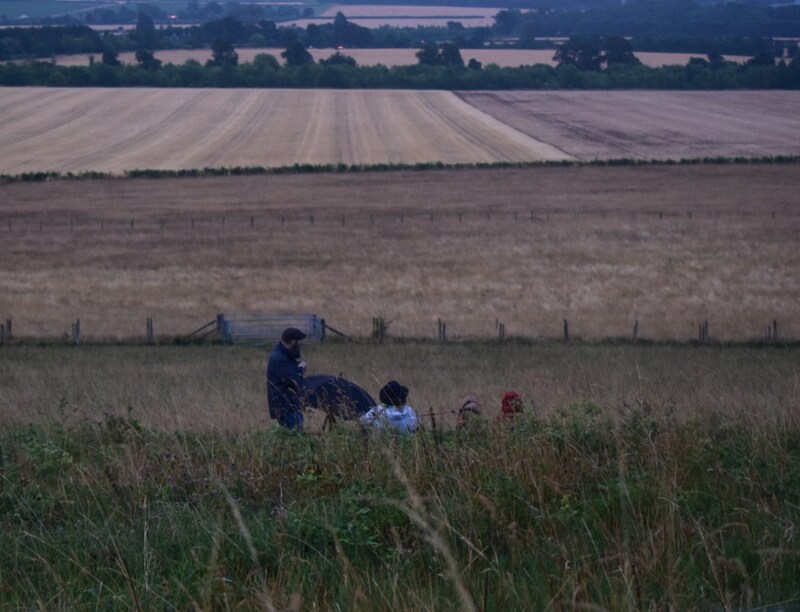 After last thunderstorm I packed my gear and set on the observation point – the Little Trees Hill, from where the south eastern horizon is clearly visible. Being en route I was wondering why I am going there when there is no clear sky on the eastern side. Moreover a huge thunderstorms occurred there. I though that maybe between these thundery clouds something even for a while will be visible. When I came on the hilltop I saw that I am not alone. There were a few people awaiting the same like me for some clear sections of sky on south-eastern horizon. Pic. 4 – 6 People awaiting in hope, that the weather conditions will improve a bit later giving the opportunity to watching longest lunar eclipse in XXIst century. I asked one family and they said me that are standing here in hope to see eclipsed Moon. I said: “The Moonrise should be visible on the azimuth 122deg”. A lady answered: “That’s very precisely”. They were marvelled my big knowledge about this phenomena. I helped their doughter to install the weather app (Pic. 2), thenceforth all of us could see how the things stands. 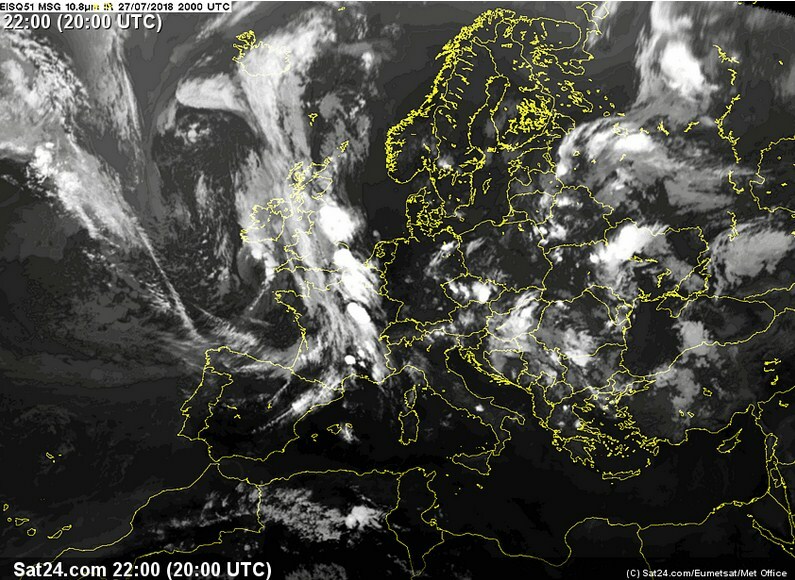 It was not looking good because the frontal thunderstorms covered all East Anglia region up to the North Sea shore. Pic. 7 View on the Azimuth 122deg, pointed by timeanddate.com as an moonrise above Cambridge at 20:51 UTC+1. Unfortunately no chance at all. Pic. 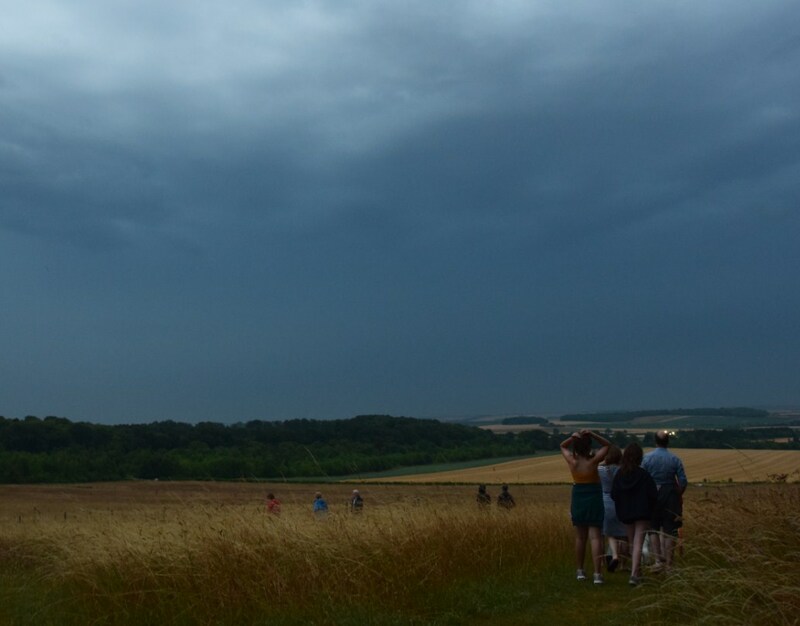 8 Thunderstorm passing above East Anglia, seen from Little Trees Hill near Cambridge and frustrated people. We were looking towards south, where sky appeared to by brighter. I could have wait till weather improvement, but after a few minutes it started rain again. I decided to back home very dissapointed. Other parties stayed there. After all I carried out the remote observation of this total lunar eclipse, that was a perfect alternative in this situation. I could see the eclipsed Moon from a few live streams, however I found also another way to observe this phenomena. Pic. 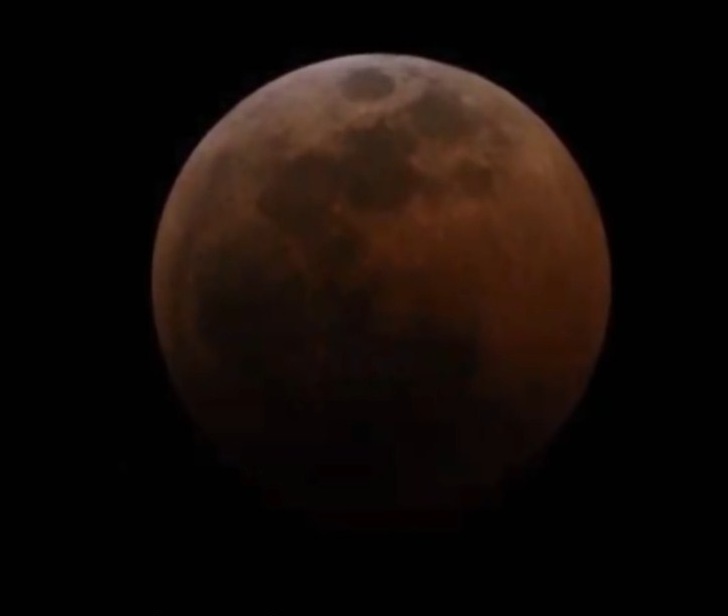 9, 10 An examples of the total lunar eclipse live stream. You can see eclipsed Moon from a few perspectives around the Globe, however the lunar disk itself will not be free of gadgets, links, etc. otherwise the Moon will look smaller. 9 – Timeanddate.com, 10 – PhotographingSpace.com. There was another few streams to choice. I used a high quality live web cameras located in few places in Europe and one in Dubai. These cameras including archive images up to 1 month before helped me to collect the data from the time when I was out of my laptop. These 5 minutes intervals combined with high ISO sensitivity brought amazing result for me. Because I have gathered the data from different parts of the continent I had a various sky conditions. Various night-time moment: For almost all web cameras (except Dubai one) the observation period spread from around 9pm to max. 1.30am. The observation commencement and termination was mainly depend on the first presence of the Moon in the webcam. In other cases (Nice, Stockholm) I was trying to see eclipsed moonrise as early as possible after sunset. Local weather conditions: were usually pretty good in these observation points, however not totally free of clouds. Clouds were prevailing mainly near the south-eastern horizon and some patchy mid-level clouds were also present. The camera direction: the most important factor, which decided about viability the observation. Usually the Moon watching were conducted when Moon was seen in the camera. Terrain features: the best were places located on shore. The sea surface reflect moonlight perfectly. I was able to see the eclipse progress then. Artifical light distribution: interrupted the observation especially when the street lamp or another source of illumination was on the same azimuth with eclipsed Moon. 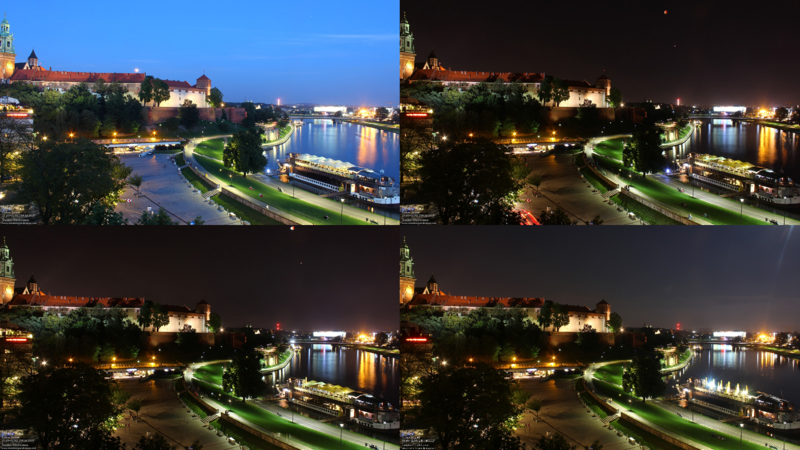 Kraków – observation was carried out since the eclipsed Moon rose above the Wawel Castle just after 9pm and left the camera view at 0.35 am. The sky was clear, making the Moon intact by clouds. Despite of high level of light pollution the illumination increasing after the total eclipse was noticed. The observation through this camera was extended 15 min (3 shots) more due to increasing lunar glow. Pic. 11 Total lunar eclipse in Kraków seen through the Sheraton Grand hotel webcam. Click to enlarge. Stockholm – perfect web camera bearing on south-west direction combined with much slower twilight progression could give a fantastic opportunity to chase the fully eclipsed Moon as early as possible after sunset. This kind of observation has been failed eventually due to patchy stratocumulus clouds covering close the horizon sky. 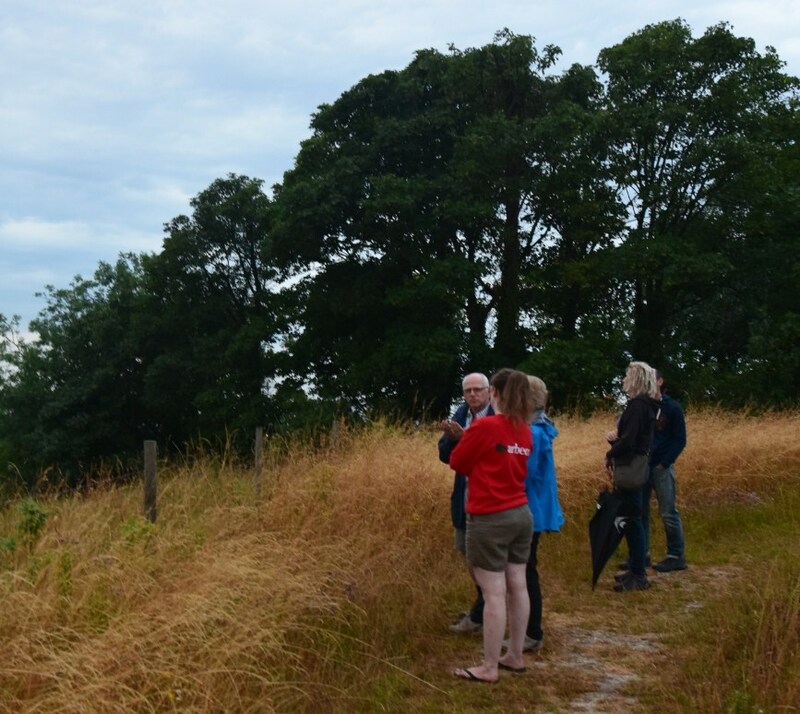 The observation started at 9.15pm at the moment of moonrise. Moon became visible just after U3 contact unfortunately. In general the weather conditions in Stockholm were the increasing of illumination was less noticeable due to twilight conditions. Stockholm in late July still experience a white nights with min. Sun altitude around 10 deg below the horizon. It makes the sky brighter finally. Pic. 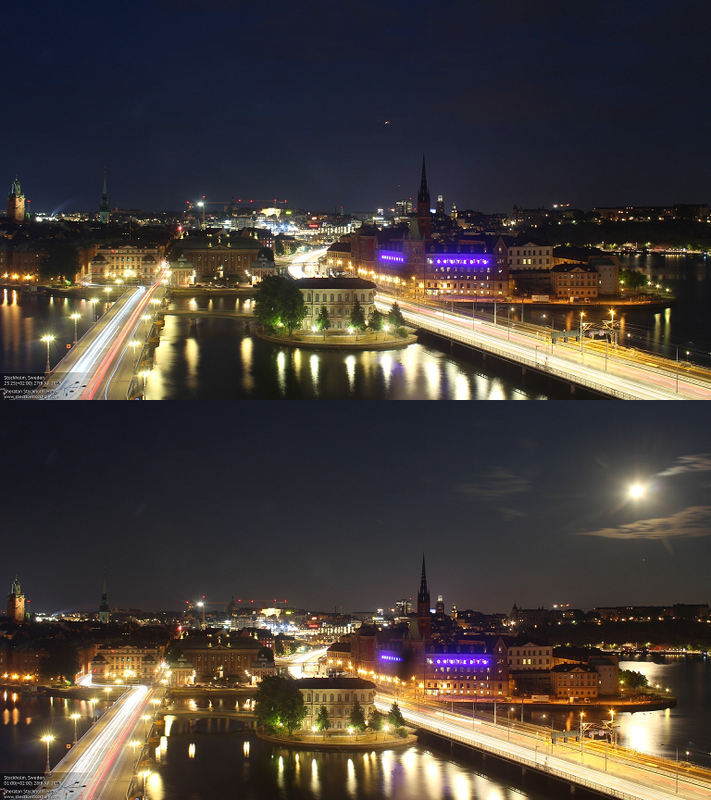 12 Total lunar eclipse seen in Stockholm through the Sheraton Stockholm hotel webcam. Click to enlarge. Florence – webcam features a terrific view on the city centre with Tuscan-Emilian Appennines and eastern sky in the background. Also in case of this streaming near the horizon sky was overcasted and clouds gave a way to eclipsed Moon at least 20 min after rise. Moreover the Moon was visible shortly because after next 5 shots left the streaming frame. Anyway it covered the U2 contact. Pic. 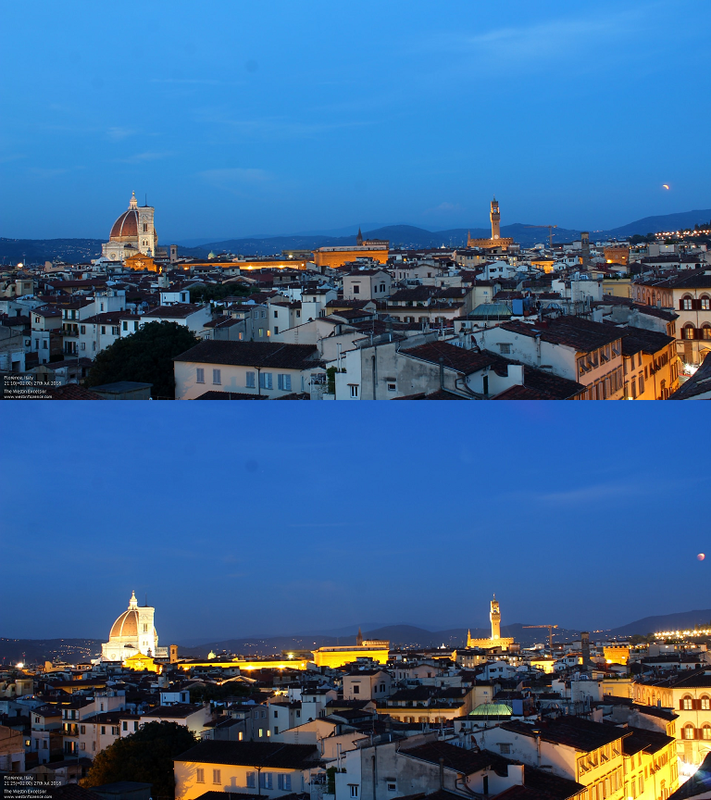 13 Total lunar eclipse seen in Florence through the Westin Excelsior webcam. Click to enlarge. 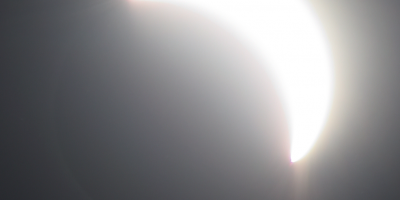 Venice – thanks to this webcam beared on SSE direction I could see nearly whole eclipse. Partially eclipsed Moon became visible during dusk. As twilight and eclipse progressed the Moon was turning into reddish tint. During total phase the Moon hided behind altocumulus clouds for around 10 min. Next for entire time was clearly visible until left the camera frame. Because of the vicinity to the camera frame and big lunar glow still appearing in the camera the observation was carried out till P4 contact. The data from this webcam brought the best output of this remote observation. Read below the details of this observation. Pic. 14 Total lunar eclipse seen in Venice through the Hotel Danieli webcam. Click to enlarge. Monte Carlo – the webcam has been headed more on ground than on the sky. In the result the sky takes maybe a quater camera frame. Moreover the camera is headed south, therefore I couldn’t see the Moon at all. Because this webcam covers the seaside I could see increasing lunar light reflected on the water surface. Regrettably the sky was not fully clear and Moon was overcasted from time to time giving a worthless output of the observation. Pic. 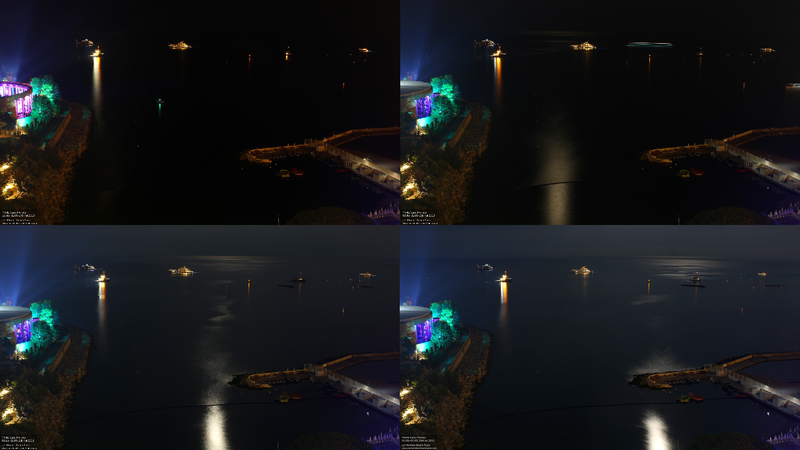 15 The light reflection during the total lunar eclipse seen on the Monte Carlo coast through the Le Meridien Beach Plaza hotel webcam. Click to enlarge. Nice – nice view on the French Riviera coast with rising partially eclipsed Moon after 9pm. 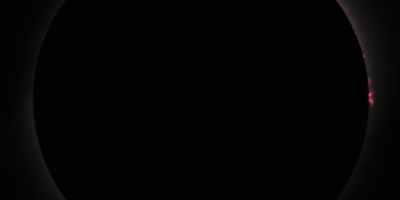 Due to high light pollution in the webcam frame the Moon persents very faintly, especially around mid-eclipse. Moreover the lunar disk was veiled by high-altitude clouds from time to time. The red Moon was present in the camera frame almost for entire totality. Pic. 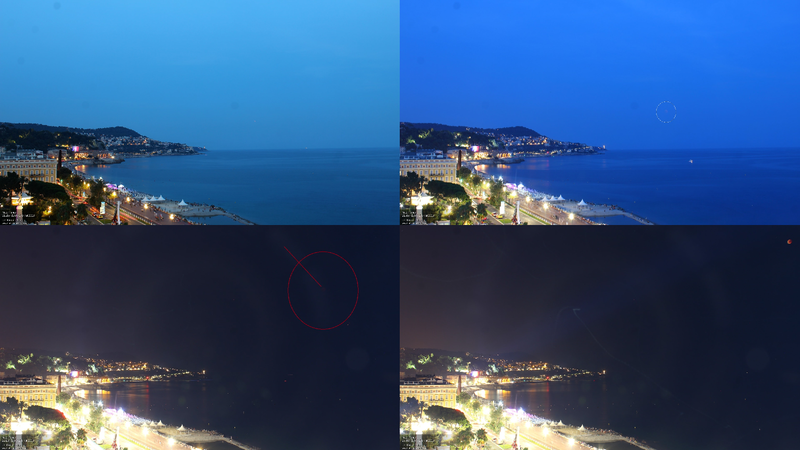 16 Total lunar eclipse seen on the French Riviera in Nice through the Le Meridien hotel webcam. Click to enlarge. Dubai – the observation output was surprisingly good. In this case patchy altocumulus clouds helped me to spot the illumination changes when started to reflect the moonlight. The most intriguing fact is that it started getting brighter around 10 min before the end of the totality. Despite of absence of the lunar disk in the webcam frame the increasing light reflected by clouds was noticeable. As time flew the Moon gradually entered the webcam frame giving the light glow a several shots before. The view from Dubai was the most light-polluted, although the data was sufficient enough to conduct a pretty good observation. In later time, when Moon went a bit down on the sky the moonlight started to diminish due to big concentration of dust. Pic. 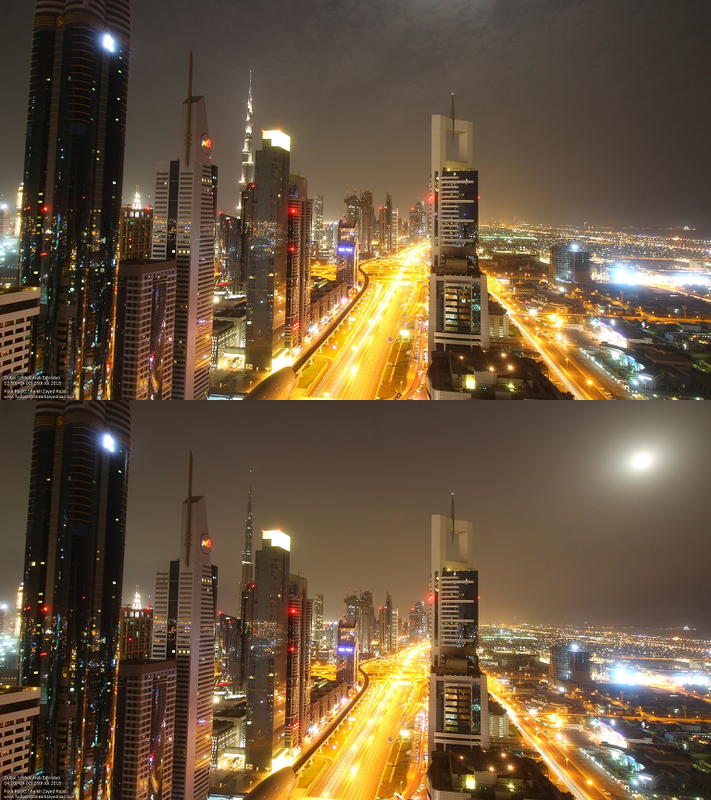 17 Total lunar eclipse above Dubai, see the illumination changes in the dusty atmosphere through the Four Points Sheikh Zayed Rd hotel webcam. See the original image here. Bryne – this is a different kind of webcam, that doesn’t work perfectly in night-time conditions. The pros of this webcam is quite big zoom, that makes the landscape very detailed. The webcam refreshes mainly every 10 – 15 minutes, sometimes less frequently. The Moon was better visible through this webcam. Because the data comes from the twilight time I could asses, from what moment the red Moon was visible. 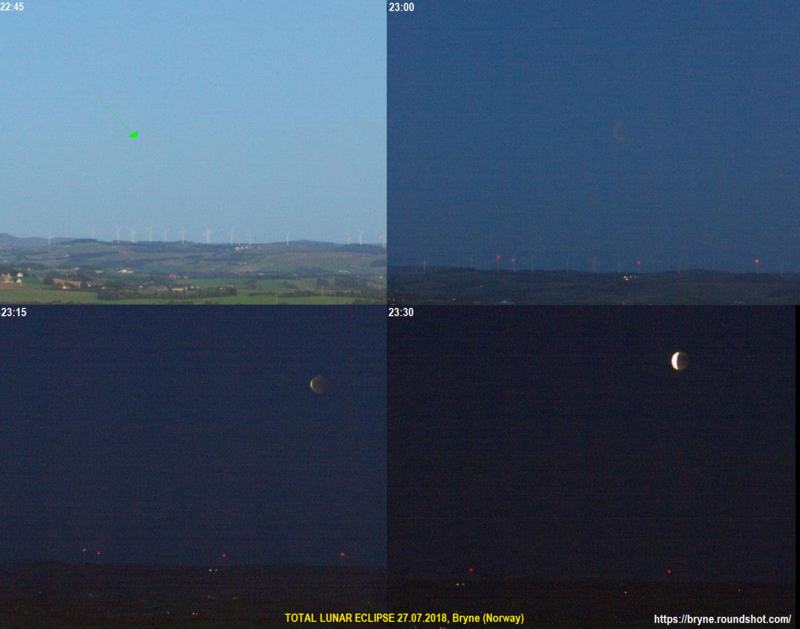 At the shot from 22:45 UTC+2 the Moon is almost invisible due to early civil twilight. The lunar disk is clearly visible on the next shot at 23:00 UTC. Pic. 18 Fully eclipsed Moon rising above Bryne. Click to enlarge. 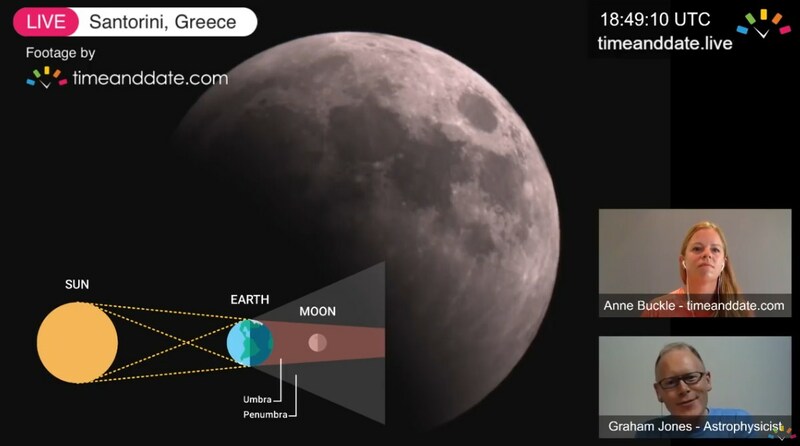 Main observation of total lunar eclipse comes from two webcams: Venice and Dubai. In both cases I focused on illumination level changes. The period of observation has been divided for 3 sections: totality, partiality and penumbral one. The illumination during totality has been recorded in Venice. Next the picture was modified with Photoshop Express, where was found that since mid-eclipse to U3 contact the ilumination growths marginally, especially before the end of totality,that is clearly understandable. The Moon itself presented poorly in the webcam view, although the umbra movement across the lunar disk was noticeable. In extremely moments of the totality lunar disk appeared to look brighter especially on the side closer to umbral contact. Upper edge of the lunar disk remined the brightest throughout entire totality, because the Moon was not dipped in Earth’s umbra enough. In order to enhance the colours and roughly point the moments of the illumination change I have modified these photos in Adobe Photoshop package. Pic. 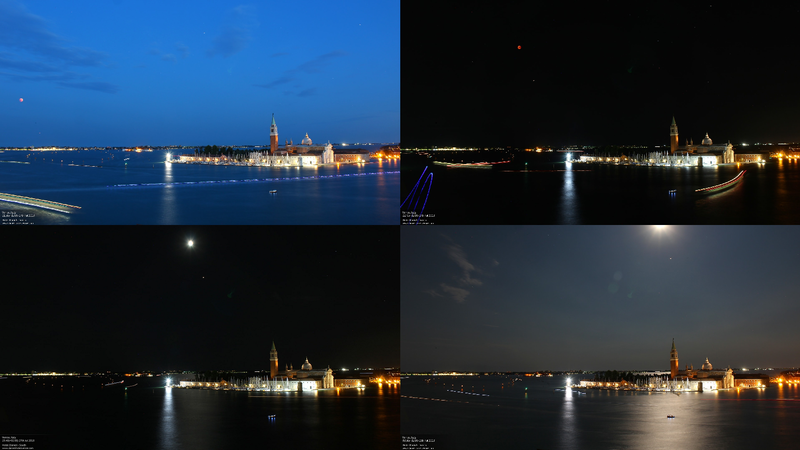 19, 20 Total lunar eclipse seen from Venice: 19 – original sequence, 20 – modified in Adobe Lightroom CC. Click to enlarge. Partial phase seems to be the most interesting period of the observation from the webcam point of view. The illumination change is the most noticeable in this time. Lunar disk turns from red (with visible dark spots – seas) to shiny big point. When lunar obscuration was around 75% the reflected moonlight started to be seen on the seawater surface. Pic. 21, 22 Total lunar eclipse seen in Venice, the partial phase: 21 – original sequence, 22 – modified in Adobe Lightroom CC. Click to enlarge. Prenumbral phase marked a significant brightness growth just after the U4 contact. The illumination difference was fainted as prenombral phase progressed bringing the full Moon conditions around 30 mins before the end of the eclipse. It has been verified clearly on the modified image. Pic. 23, 24 Total lunar eclipse seen in Venice, prenumbral phase. 23 – original sequence, 24 – modified in Adobe Photoshop Express with rough moment where illumination changes terminated. Click to enlarge. Dubai webcam has been located in different conditions. There is high light pollution and not sea in the frame. Despite of these factors the output was surprisingly good. I could spot increasing illumination, especially on the altocumulus clouds just after the U3 contact. 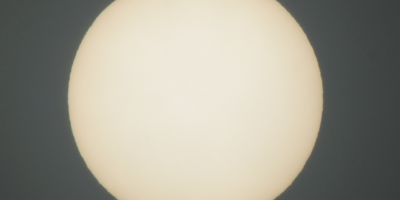 Interesting is also the fact, that sequence captured at the U3 moment looks slightly brighter than previous ones. 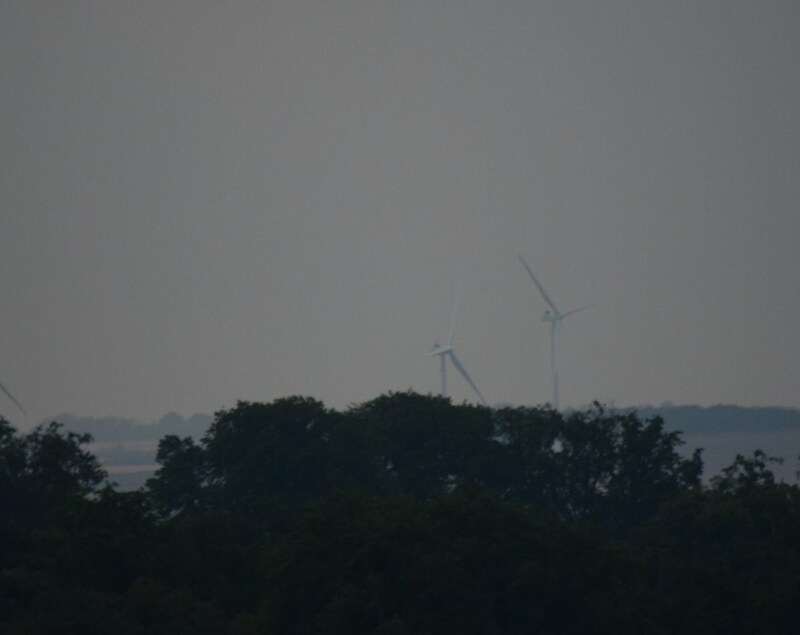 The modified photo clarifies this issue, that could be oused by the change of local atmospheric conditions (some dusty air movements or increasing the cloudiness, that reflected the light glow). Therefore the sequence from 2:05am and 2.10am looks more yellowish. On the shot from 2.15 a faint whitish moonlight becomes visible. Pic. 25, 26 Total lunar eclipse seen in Dubai. End of totality and entire partial phase with lunar disk out of camera frame, however the luminance changes has been noticed. 25 – original photo sequence, 26 – modified in Adobe Photoshop Express. Click to enlarge. Prenumbral phase in Dubai webcam was not clearly visible. Firstly the Moon was not visible entirely in the frame, hence the brightening the top of the sequences was caused approaching the lunar disk towards the camera. Secondly as Moon moved lower in the sky, moonlight became fainter due to extremely dusty conditions. At the outcome the lunar disk during P4 contact was quite fuzzy and not as bright as appeared to be that time. Pic. 27, 28 Total lunar eclipse seen in Dubai, prenumbral phase with Moon dimining in dusty atmosphere: 27 – original photo sequence, 28 – modified in Adobe Photoshop Express. Click to enlarge. The view through the webcams (except the last one in Bryne) can be compared to ability of human vision in field conditions. Despite of brightening the lunar disk during totality the light level of observation area remained the same. It needs to be repeated with DSLR camera. First noticeable increasing of light level has been observed in partial phase when umbral obscuration around 75%. The biggest difference in illumination level has been observed when umbral obscuration lower than 60%. The points 2nd, 3rd and 4th can be related to the chart as per below. Pic. 29 The illumination changes chart according to S.M. Silverman, based on total lunar eclipse observation during the 12th/13th April 1968 night. The biggest difference in illumination level has been observed up to around 85% penumbral obscuration. When umbral obscuration lower than 40 % the illumination changes were not noticeable. The lunar light corona became visible just after U3 contact. Pic. 30 Partially eclipsed Moon is just behind the receeding clouds. At the finish I can say, that the remote observation of lunar eclipse is an perfect choice for someone, who live in different part of the Globe, where eclipse is invisible or when weather is not good enough. 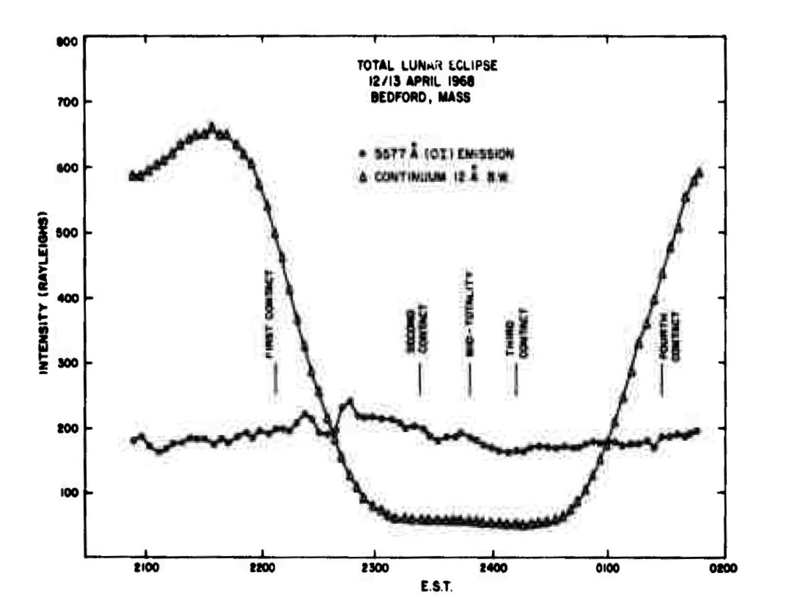 Silvermann S.M., 1974, Sky brightness during eclipses, Air Force Cambridge Research Labolatories, Massachusets.